has finally hatched and landed here... It only took me a year to complete... Yes, it is another of my projects from Silver Bella 2009. 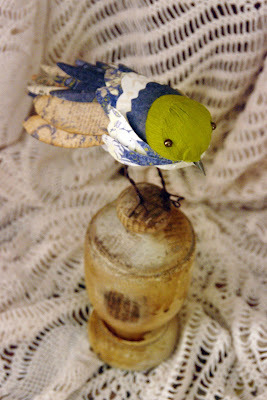 It was a challenging class that pushed me to a new level of 3-d paper crafting and I am just lovin' this little guy! 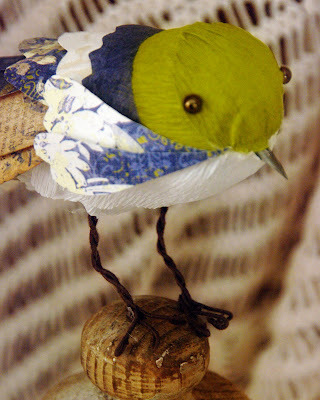 Each detail just makes me smile, from the vintage hymnal and flocked wallpaper feathers, to the beak made from a vintage ink pen, to his little feet and his vintage perch. Hope you have a wonderfuly creative day. such a lovely bird ! Beautiful, Sheila! I love your colors and patterns. 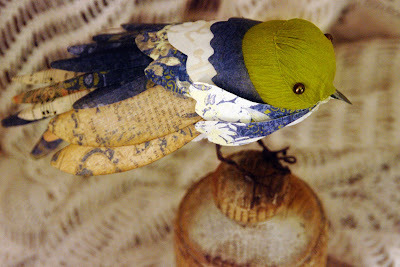 I remember hearing that this birdie was an extremely challenging project but well worth the effort. I did get some picture taken of my ornaments! I had a lot of fun and they turned out pretty well. Sending you big hugs and thanks! What a tweet, your sweet birdie is to see and finished work is always a pweasure. Tweety bird and I just wuv him! Oh good my little Bluebonnet has a friend!